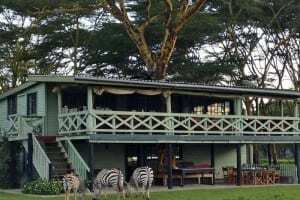 The larger of two lovely new guest cottages set in beautiful shady gardens on the southern shore​ of Lake Naivasha which come complete with swimming pool and floodlit tennis court. Comfortable, private, furnished with taste and style and perfect for a self-contained and relaxing escape from Nairobi. There are few more idyllic places to stay within easy reach of Nairobi than these charming and wonderfully authentic guest cottages. Set on an old colonial-era farmstead and amid beautiful grounds leading down to Lake Naivasha, they are the perfect retreat for anyone who appreciates peace, seclusion and gorgeous surroundings inside and out. Cottage 2 sleeps up to 10 guests and sits in its own private walled gardens. Downstairs are three double bedrooms with ensuite bathrooms, along with drawing room with fireplace, separate dining room, kitchen and bathroom. Upstairs is an open-plan bedroom area with two single beds and one double bed – an ideal ‘dormitory’ for children. Leading off this area is an open-air terrace and outside on the ground floor there is a large veranda with sitting area and outside dining table. The Stable Suite is an additional self-contained double bedroom with ensuite bathroom which can be combined with either cottage to accommodate a further two guests – making it possible to accommodate a total of 18 guests at the property. All the accommodation has been recently refurbished with imagination and attention to detail, and is very attractively furnished and decorated throughout. The rooms are filled with lovely furniture and fittings and with paintings by some of Kenya’s most celebrated artists. The cottages sit in the grounds of the main farm house in lovely gardens shaded by towering acacia trees. Guests also have the use of the floodlit hard tennis court with viewing pavilion and the lovely swimming pool with poolside pavilion, dining area and sunloungers. There is also a children’s play area with swings and a below-ground trampoline. Lake Naivasha sits at the highest elevation of the Kenyan Rift valley at 1,884 metres (6,181 ft) and around 90km north west of Nairobi. The name Naivasha comes from the word Nai’posha meaning rough water in the language of the Maasai, and the surface of the 50-square mile lake can often be subject to unexpected squalls and storms. In early colonial times the lake became a popular retreat for white settlers with a number of beautiful and unusual houses being built along the lake shore, such as the notorious Djinn Palace. In the 1930s the lake began to be used by Imperial Airways as a landing place for their flying boats travelling between England and South Africa. Naivasha and the surrounding area remains popular with weekenders from Nairobi and there are numerous water sports and related activities on hand for visitors. Boating, sailing, fishing, and bird watching are available at various locations around the lake – as is horse riding, biking and hiking. Golf takes place in a spectacular location at the Great Rift Valley Golf Resort off North Lake Road. Apart from tourism, the major business of Naivasha is floriculture – numerous flower farms are to be found close to the lake shore and export large quantities of flowers, especially roses, to Europe daily. Another major commercial enterprise on the lake is the geothermal plant, which was commissioned in 1981 and now generates a substantial amount of electricity. The lake and its surroundings are home to a wide variety of wildlife and game including a large population of Hippoptomus and several species of fish. Over 400 species of birds have been recorded here, and the lake is home to Pelicans and Kenya’s largest concentration of African Fish Eagles. You will often see large flocks of Flamingos on Lake Oloidien which adjoins the South West corner of the lake. Hells Gate National Park is one of the few National Parks that permits walking, bicycling and rock climbing. Both Fischer’s Tower and Central Tower make challenging ascents for rock climbers, as does the escarpment. The gorge, slicing through striking rock formations, contains a series of hot springs that heat the surrounding rocks, and local guides are available to guide walkers through the gorge. The park is home to plains game and other wildlife, and is particularly known for vultures, eagles and buzzards. The setting for the film The Lion King was heavily based on the area. Crescent Island, an arc of land linked to the mainland lake shore by a causeway, has a number of animals but no predators, and makes a lovely place to walk and picnic. Crater Lake, to the West of Lake Naivasha, also has wildlife, birdlike and attractive walks. Mount Longonot, between Naivasha and Nairobi, is an inactive volcano whose crater makes for a lovely but quite strenuous walk with spectacular views both into the crater and across the surrounding area. For food and general supplies there is good shopping in Naivasha Town and at the new Buffalo Mall which has a large Tusky’s supermarket. There is an excellent new Farm Shop and Butchery on South Lake Road, where you will also find attractive crafts for sale at Lake Elementaita Weavers and Fired Earth Pottery. Recommended places to eat off South Lake Road include Carnelly’s Restaurant, The Ranch House Bistro and The Club House Cafe. Naivasha is approximately 85 km (55 miles) from Nairobi and guests should allow 1 ½ hours to drive from Nairobi to Lucita Farm. The cottages are situated just off South Lake Road close to Lake Naivasha Country Club. A 4-wheel drive vehicle is not necessary. Lucita Farm is 7.5 km from Naivasha Town and 10.5 km from the A104, the main Nairobi-Nakuru highway. There is also access from Nairobi via the C38 the ‘Old Naivasha Road’ and Mai Mahiu town. “Thank you Lucita Farm and the fantastic team who made our weekend away so relaxing. We had the whole place to ourselves as we took both houses which was an absolute treat! The larger guest house has a fire place and plenty of room for friends to gather, although the smaller one has views over the lake – it’s hard to say which is better as they are both so well put together! We had a great time lounging by the pool and enjoying our evenings by the fire. We can’t wait to come back with more friends soon”.